It's Muffin Tin Monday and themes are back! This week the theme is alphabet. Pierce is definitely very into words and trying to learn how to read right now. All day long he's sounding out words and talking about "Cat starts with the letter C" or "Elmo starts with the letter E" or "Lellow starts with the letter L". Um, still working on getting him to understand that it's YELLOW and starts with a Y. So for alphabet we did his name and foods that start with each letter. And that, my friends, spells Pierce. Want to join in Muffin Tin Monday? This is such a wonderful idea. I bet he loved seeing his name in food. Great idea! I can't wait to start doing these my little guy. What a good idea to do Pierce's name like that! Will your little ones be joining in too soon? Love it!!! I must say it is a great idea too...this is what we did. Great idea to use his name!! I love it! The alphabet and an acrostic, very clever. 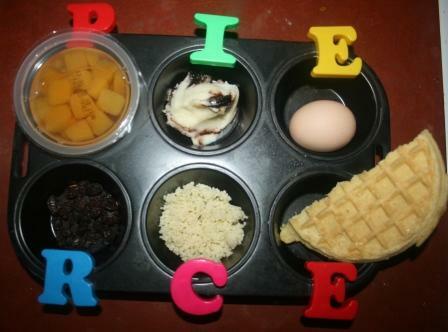 It's a good thing you pointed out that it read "Pierce", because my pea-brain just saw "Pie" and "rce". I was wondering if "RCE" was an abbreviation for "rice", to go along with the pie, but then there wasn't actually pie or rice in any of the muffin cup spots. Great idea to use the letters of his name! Love it! Oh! This is the cutest tin! I love it. What a fantastic idea. I get what you're saying about the whole "L" and "Y" -- we tend to switch our [like how I said WE and OUR there?] "Vs" and "Bs" a lot! So when she's mad at me she says, "NEBER!" ;) hee hee.